St. Patrick's Day is on the weekend as I am sure you already know. I know a lot of you will be making corned beef dinners and the like. For those of you that don't have hours to make a large Irish dinner this is a quick way to get your corned beef fix this weekend. 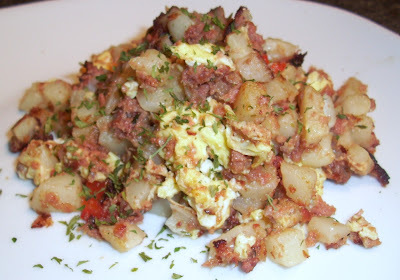 Corned beef hash can be served for any meal of the day, breakfast, brunch, lunch or dinner. It is easy to prepare and is limitless in variations. It is a great way to use up leftovers as well. Hash was created during the war when rationing of food was in place. It was a cheap way to get a bit of meat into the diet and still be a satisfying meal. So whatever you are serving this weekend... Happy St. Patrick's Day everyone! Add the meat and potatoes and parsley. Cook until potatoes are golden and it is all heated through. Move the hash to one side of the pan. Add the eggs and cook until done then combine with the hash. Serve with ketchup or chili sauce.